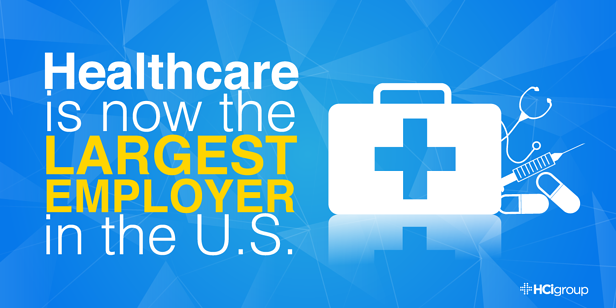 Healthcare is now the Largest Employer in the U.S.
As the U.S. population continues to age and healthcare spending increases, healthcare has become the largest labor market in America – and healthcare IT plays a big role. Americans are getting older. By 2025, one-quarter of the nation’s workforce will be older than 55. Naturally, the need for healthcare services has grown as the population continues to age. According to US Census Bureau statistics, the nation’s median age rose from 35.2 years to 37.9 year between 2000 and 2016. Furthermore, residents 65 and older grew from 35 million to 49.2 million during the same period. The earliest group in the baby boomer generation turned 65 years old in 2011. As the baby boomer generation continues to age, there will be roughly one in five Americans who are over the age of 65 by 2030. Programs like Medicare, Medicaid and healthcare benefits for government employees and veterans are also a contributing factor to the growth of healthcare jobs in the United States. Going hand-in-hand with the aging baby boomer population, these government programs are beginning to demand additional support. The government also subsidizes private insurance by providing tax breaks for employers who sponsor healthcare for their employees. Programs and subsidies like these help the healthcare job market more recession-proof than other industries. Healthcare technology continues to be a driving force in the creation of jobs in healthcare. As more and more healthcare provider facilities throughout the U.S. are challenged with maintaining margins just to stay afloat, many are turning to technology as an answer to cost reduction. Opportunities like these are music to the ears of healthcare IT service companies, who have seen steady growth in job creation over the past decade or so. The global healthcare IT market is expected to hit $280 billion by 2021, mostly driven by the demand for cost reduction while adhering to ongoing regulatory requirements. This number represents nearly 16% growth from 2016-2021. Recently at The International Consumer Electronics Show in Las Vegas, there was a lot of buzz surrounding healthcare IT. With healthy growth projections for wearable medical technology, robotics and artificial intelligence, everyone wants a piece of the pie. While we don’t know what healthcare technology will look like 10 years from now, we do know that many new jobs will continue to be created to keep up. For more information on jobs in healthcare through The HCI Group, Click here to search for jobs in healthcare IT.